As a prospective student or graduate of the Sterling Style Academy, we know one of your largest concerns is how am I going to get clients. 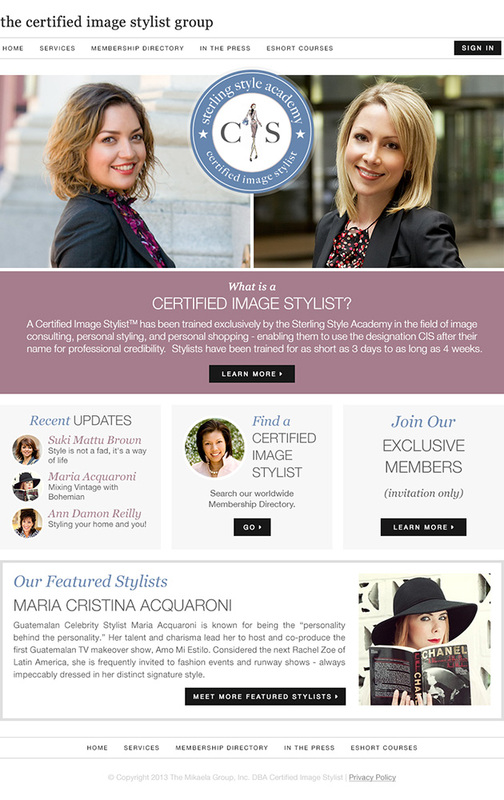 Therefore the Sterling Style Academy has devised a viable online marketing tool for you to get clients, help you market your services, and position yourself with credibility by becoming a member of the Certified Image Stylist Group. The Certified Image Stylist Group is exclusively comprised of only Sterling Style Academy graduates who are invited to join the group because they have demonstrated high standards of excellence and creativity during training. This is not an organization or an association of stylists; it is a membership directory of stellar Sterling Style Academy graduates. We know it takes time to create your company marketing materials. By becoming a member, you can start marketing yourself immediately upon graduation and run your own company too! Therefore if you're a new graduate and do not have any marketing materials, use this platform as you would your own website. You can always add more information later. You will receive a non-refundable charge on your credit card from Global Image Group, Inc.